Ready for our very first student interview? This is it! Today’s student guest is Camden, an amazing, high-achieving 10-year-old fifth grader at H.E. Bonner Elementary in Moncks Corner, South Carolina. Even though she loves school, there’s one thing Camden wishes she could change: she wishes students were disciplined more to reduce problems with bullying and being mean to other students. Camden also shares what she wishes that her teachers understood about her. She tries really hard at school, she explains, and she isn’t sure that her teachers always see or appreciate her efforts. This episode also offers valuable insight into grading from a student’s perspective. Camden feels very strongly about her grades and wants to keep them high. She’ll share a story today about a time she felt that she was graded unfairly. Of course, we’ll also dig into technology! Camden enthusiastically rattles off the impressive list of tools they use in class. I’ll include a list below! I love to ask students what they would learn at school if they could choose, and Camden’s answers are great: she wants to learn languages (especially French so she can visit Paris) as well as dance. Don’t miss this great episode with a fantastic young woman! 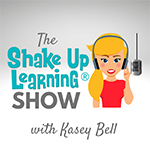 And don’t forget to answer the question of the week: “What can we learn from honest conversations with students about the learning in our classrooms?” Post your answer in the the Shake Up Learning Community on Facebook, or share it on your favorite social media platform with the hashtag #shakeuplearning. Finally, if you know someone who would be a great student guest on a future episode, fill out the application here! And if you want to work with me or bring me to your school, check out this link. [00:28] - Welcome back to the show! Kasey explains the topic of today’s episode, which is the show’s first student interview. [01:55] - Kasey gives a quick shoutout to Stellaffffff, who left a fantastic review on iTunes! [02:58] - We have a quick question from Laura Cahill: How do we support more reluctant teachers to embrace technology and new ideas in the classroom? [08:04] - Kasey introduces the show’s very first student guest: Camden from South Carolina! [08:36] - We hear about Camden’s age, grade level, and what she likes most about going to school. [09:40] - If Camden could change anything about school, what would it be? [11:01] - Camden shifts into talking about her teachers, sharing one thing that she wishes that her teachers understood about her. [11:54] - Kasey asks Camden about how much a grade means to her, and they chat about whether grades are always reflective of how much work Camden puts in. [14:41] - Does Camden use technology in class every day? [16:39] - Camden talks about what she did in school today specifically. [17:42] - We hear about some opportunities that Camden has had to create things using a Chromebook. [19:39] - Camden shares her thoughts on the benefits of working with her friends on group projects. She also likes working with kids she’s not as close with. [21:02] - If she still had to go to school every day, but could learn anything she wanted, what would Camden want to learn? [23:09] - Camden chats about her many sports and activities outside of school. [25:10] - We learn about why Camden wants to start a podcast of her own. [26:34] - Here’s the podcast question for the week: what can we learn from honest conversations with students about the learning in our classrooms? [27:39] - Kasey explains how to apply to be a student guest on the podcast in a future episode: fill out the application here! Buy them individually, or get the whole bundle and save! If you miss this open enrollment period, you’ll have to wait until November, so don’t miss this chance. Learn more at this link! [30:30] - Kasey takes a moment to thank listeners for tuning in.